Canterbury were told to take their match-defining missed conversion attempt against Melbourne from the wrong spot and too close to the sideline, the NRL has admitted. Bulldogs kicker Rhyse Martin missed a kick on the siren to level the scores at 18-18 and send the game into golden point on Sunday against the Storm. 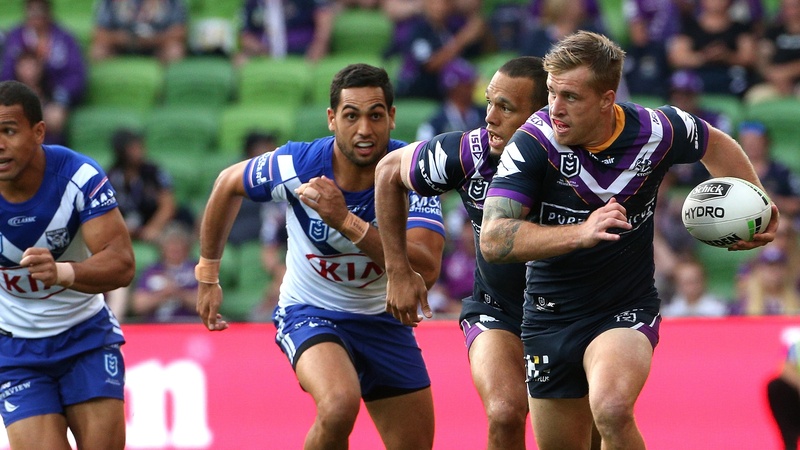 The conversion went well wide of the posts, but the NRL conceded on Monday he was asked to kick it from the sideline when the ball was put down by Reimis Smith around three or four metres in field. "In our view the referees should not have allowed that to happen, particularly given the circumstances of the game," the NRL's head of football Graham Annesley said. "And that kick should have been allowed to be taken 3-4 metres in from touch. "It doesn't mean he would have kicked the goal, we'll never know. But the referees have got a responsibility to line it up and make sure they take the kick from the mark." In the footage, the assistant referee can be seen standing in line with where the ball is put down as the try goes to the bunker, before walking to the sideline to talk to the chief referee. Martin then lines up his kick from behind where the two are standing. As is NRL protocol, it is the head referee's job to ensure the kick is taken in line from where the ball is grounded, and there is no fault left with the player. The Bulldogs were informed of the error on Monday morning and, while it's understood they were not angry over the matter, coach Dean Pay questioned how it was possible. "It's a miss, and it's an important miss they shouldn't have got wrong," Annesley said. "They clearly weren't paying enough attention."